The Knitting Pirate » In Which the Pirate Weaves in the Ends. « In Which the Pirate Knits with Handspun. In Which the Pirate Weaves in the Ends. 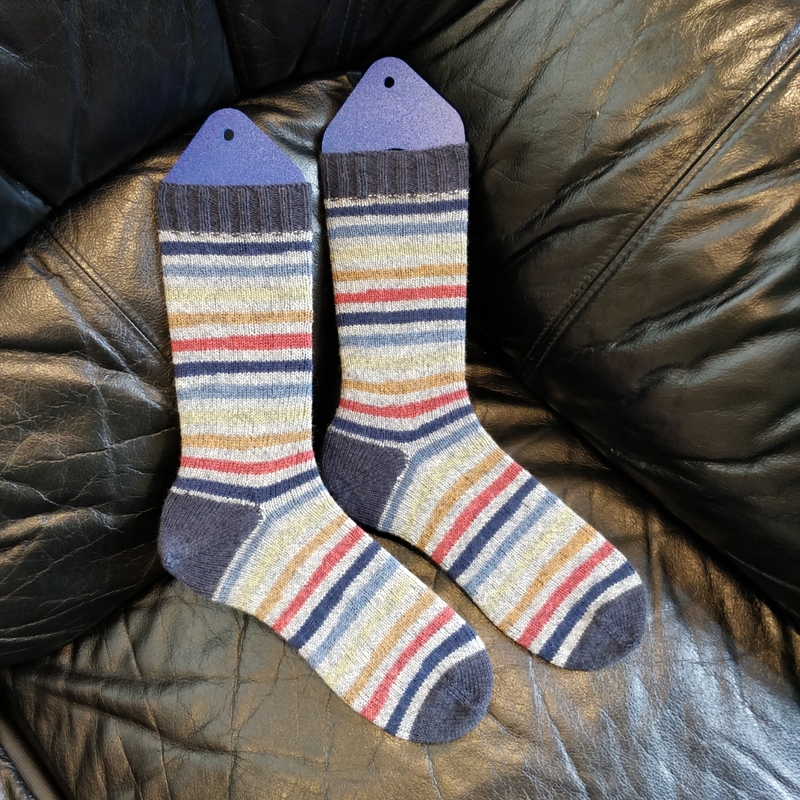 These socks were knit toe-up with Kroy Socks in the "Blue Striped Ragg" colourway, and the contrast cuffs/heels/toes are knit in Premier Serenity in navy blue. I... was kind of displeased with both yarns, actually. The Kroy was all right, but every other colourway of Kroy socks I've knit has been thick and squishy on US 2 (3 mm) needles, and this was just thinner than a standard sock yarn. It was fine, just not what I was looking for. The Serenity, on the other hand, was thin and slippery and splitty and I don't like it at all. Hrmph. That said, I'm pretty pleased with the finished socks. I had to do some duplicate stitch reinforcing around the corners of the heels, but the extra short rows in these heels make them fit better than the other afterthought heels I've done before. And I *love* the stripes! I do wish I'd thought of knitting the first round of the cuff to prevent those little purl blips, but they're kinda cute so I guess it's okay. So... what's next? I'm still working on the handspun sock, but that's not great at traveling because the yarn-cake collapses when I put it in my bag. I need a sock that I can carry around with me, and a pattern that's interesting, memorizable, and doesn't take too much concentration to knit. Maybe I'll pull out the stitch dictionaries and put something together! This entry was posted on Thursday, May 31st, 2018 at 09:42 and is filed under afterthought heel, plain stockinette, sock. You can follow any responses to this entry through the RSS 2.0 feed. Both comments and pings are currently closed.